Click on the “Documents” and “Details” tabs on that page for maps and description. (WEN update May 2014) The Comox-Helmcken Greenway was approved by Vancouver City Council on December 12, 2012 at a stated cost of $5.46 million, and City staff projected operating costs and lost revenues would be $320,000 per year due to the Greenway, which we calculate to be $6.4 million over 20 years – assuming no inflation. Construction was completed, the Greenway opened to traffic in June 2013, and the community had nearly experienced one full year with it to May 2014. As of mid-May, we noticed recently-installed traffic counters on Comox and nearby streets. What will the data show? The City undertook a survey following the completion of the greenway, asking for input on the construction process, and the City’s communications during this process, but to date, no results of this survey have been made available for public review. Local residents have been surprised to notice how little bicycle traffic is seen on Comox, even on lovely days. Many cyclists continue to follow their preferred routes on other streets and the (flatter) Seawall. Meanwhile, drivers and delivery vehicles have shown some frustration with the obstacles to vehicle traffic, particularly at the Comox-Denman intersection — the concrete divider across from the Coast Hotel driveway exit has now been reconstructed twice, and still doesn’t seem to work well for buses. Residents on other nearby streets have noticed a significant increase in traffic in lanes and on other streets, including Nelson, where at busy times up to ten vehicles are backed up at stop signs waiting for a chance to go ahead. Impacts of extra traffic have resulted in more fumes and noise on other streets. Lighting for the greenway was a topic of concern at the time of installation due to excessive glare and an unsightly ghostly colour. While the City has made some adjustments, glare from the new lighting continues to be a complaint of nearby residents. We note that this Greenway was part of a master plan for the City and not particularly requested by West End community. While the route may be considered nice by some, it did come at a cost to the community and city finances, with some winners and losers being created. The relatively low level of actual usage of the Comox-Helmcken Greenway makes some wonder it if was worth it. Article in Metro News — good details. The official city website is http://vancouver.ca/streets-transportation/comox-helmcken.aspx. 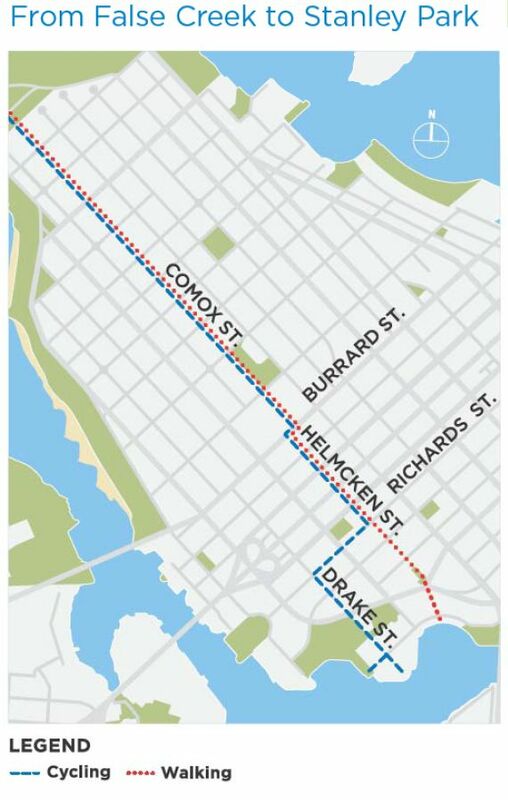 The Comox-Helmcken Greenway is part of the City Greenway network, connecting Stanley Park to False Creek. The Greenway route was approved by Council as part of the 2002 Downtown Transportation Plan. The City announced that public consultation on the Comox-Helmcken Greenway project would occur over the fall and winter 2011, with project approval expected in spring 2012, and construction to June 2013. Greenways are public corridors for pedestrians and cyclists that connect parks, nature reserves, cultural features, historic sites, neighbourhoods and retail areas. They can include many features, such as “corner bulges and traffic circles to calm traffic and improve pedestrian comfort while providing opportunities for people to personalize their street through gardening” and much more. This Courier wrote an article entitled Residents rally against the Greenway project. Comments from residents are here. The final plan is here. This is a “FAQ” on greenways.